Freeport, Grand Bahama- Recently, little Miss Markaylah Foster, an 8-year-old third grade student at Hugh W. Campbell Primary, reached out to the Keep Grand Bahama Clean (KGBC) Committee through her Grandmother, Chrystal Johnson, and Parents, Michelle Gaitor and Marcel Foster, expressing an interest in becoming an environmental ambassador and junior member of the KGBC initiative. During a specially organized courtesy meeting, little Markaylah shared her love for the environment and some of the things that she would like to see done in her community. “I would like to see more garbage bins on the streets and encourage persons to stop littering” commented Markaylah. She not only expressed her passion about what others should do, but she also shared how she wants to make her contribution by being a part of the environmental movement. 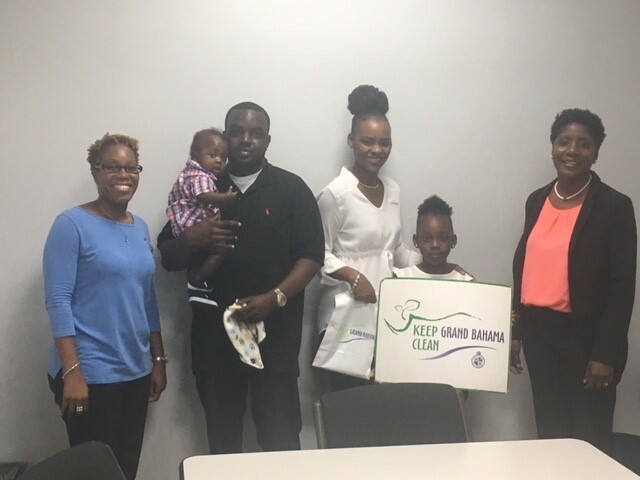 As a result, Markaylah is getting ready to organize her own clean-up event in the Fall with family and friends, and with the support of the KGBC Committee. In an effort to show her environmental stewardship, Markaylah has also placed various donation boxes in Ritchie’s Calypso stores 1 and 2, to assist with gathering funds to purchase the garbage bins. Her parents expressed their elation about her passion and their willingness to support her in any way they can. Nakira Wilchcombe, Chairperson of the KGBC Committee also shared her sentiments about Markaylah’s interest, stating, “We truly salute Markaylah for wanting to make a difference at such a young age and we encourage other young persons to join her. The more partners and residents we have committed to the mission of keeping our island clean, no matter the age, the better our communities will be”.